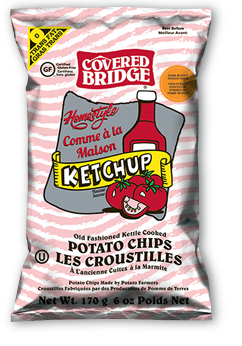 There are many things to like about there Covered Bridge bag design and just one to dislike There are also difficulties for any Canadian manufacturer that need to be overcome, which will always impact design. So, the good: The small logo is appropriately sized and stands out. The wavy flavor color coded bags are also great. Although it should be pointed out that the vast majority are shades of green or blue for some odd reason. Covered bridge handle the issue of two languages very well - the main image includes English, but in larger text is the French wording. This difficulty is handled very well. The bad: Really, what is it with these Chips companies are cartoon imagery! And poor cartoon imagery in this case. It is one thing having an uninspiring photo of Chips, but providing childish cartoons is simply the other side of the same coin. However, one major positive outweighs them all. The main purpose of food manufacturer packaging is to make their product stand out. These bags achieve this very well. Although not quite as thickly cut as some Kettle Cooked Chips, these packed a reasonable punch in the Crunch states. There was no mush at the end and there was no brittle crack and crackle at the beginning. These were magnificent looking Potato Chips. There was skin on edges, bends, gnarls and curls. There were oil boils. Mostly, there was a heavy a characterful coating of red seasoning powder. A Nose Plunge Test revealed a pleasant and rather Sherry like aroma, which although odd, kinda made sense. The taste was sweet and Ketchup based, but the balanced veered a little too near Vinegar to be truly accurate. Having said that, Ketchup goes on stuff, it isn't supposed to be 'stuff' on its own. I would go further and say that many people probably don't really know what Ketchup tastes like.